Nothing much, just a couple of extra cash im willing to spend to improve my current laptop set. I have razer abysuss + razer lycosa + AKG DJ81 atm and i could replace 1 of these... considering the fact that abysuss works fine for me as an rts mouse its either the lycosa or my headphone is being replace. I decided to get a new headphone! Cash acquired: 200$. Price range: <150$. Now Patrick told me he has no experience AT ALL in Shure's line of headphones so i will need you guys help on this. I know they produced some awesome earplug but are their headphones any good? This weekend i will go try all these 4 out myself but i really want to know your thoughts first :D.
Having worn my M50s on an airplane I will vouch that they don't have the best noise cancellation. They are very good dampeners, though! I can't hear anything when I'm wearing them with sufficient volume. Someone could be yelling for me downstairs and I won't hear a thing, haha. I would most definitely recommend them for ANYTHING except airplanes. Not sure why you would need noise cancellation for anything else. I get the feeling that noise cancellation is just one of those tags companies use to drive the price of a headphone up. Double edit: By not the best noise cancellation I mean they don't technically have noise cancellation. They just have really good isolation. its a personal thing, it helps me concentrate of works/study. Like the current akg im having even if music not on, i cant hear people alks at normal volume behind my back. 2 days ago there were a storm in middle of the night and my roomate was yelling at me behind my back to close the window and i have no clue at all. To me noise cancellation and comfort goes first, then sound quality. Edit: I'm pretty confident with the m50s on you wouldn't be able to hear much of anything music on or not. I tried some Shure in-ear monitors years ago when they were just coming out. Definitely a premier brand. The ones with an 'i' in the model have a smartphone inline control thingy, and the S5 are essentially the same earphones, but a more rugged version. Only you know how rough the life of your earphones are. Personally I still prefer a closed over ear headphone like the Audio Technica A700 for home use. Probably quite close to your old AKGs, though I've not tried the model you're replacing. Personally, I'm using the Klipsch Image One these days, but that's because I use it for listening on the go in addition to at home. For dedicated at home use, I would recommend the Audio Technicas. "My shoes are too tight, but it doesn't matter, because I have forgotten how to dance." You need to be clear if you are talking about noise cancellation or isolation, they are completely different. Noise cancellation: an active technology that cancels out ambien noise by analyzing it and generating an inverse waveform. Isolation: the physical blocking of outside noises in any headphone (you want closed ear headphones for best isolation). If you are going for maximum sound quality then cancellation isn't really recommended, you shouldn't really need it unless you are goingto be using them in a really consistently noisy place (factory/plane/car). Any solid closed ear headphones should easily block out normal room noises. Personally, I'd look into recabling the AKGs to save some money or go for IEMs if isolation is really important (I included the Monster Turbines in the chart to show how insanely isolating IEMs are by comparison to headphones). Shure SRH440 is a great closed headphone at that price. I have not tried 550 and 750. If you get SRH440 you may want to consider getting 840 pads as they are supposedly more comfortable. For IEMs, Etymotic MC5 has really great isolation but maybe there are better choices depending on what music you listen to. If you can find a store to test them out then please do so, otherwise relying on internet views kinda skews your thinking and makes you believe things you may not really be able to hear, it will color your review immensely. It's what I learned after buying DT880s the other week. anyway, thanks cragus for such useful website :D. I personally like full-sized headphone than IEMs. I have used IEMs a ton back in highschool where i have to hide stuff in class but NO MORE!!!!!!!! hehehehehe. I have a set of headphones that I got pretty cheap, around $60 IIRC. Shure SRH240s, circumaural, fullsized, great noise isolation especially when wearing HuK style or with earphones underneath. how are the DT880s, i'm debating between those or the 990s. I have the 840s but I wouldn't say that they're much better than any other headphone. The most comfortable ones I've ever felt were the DT880s. If you're interested I might sell my 840s to you for a good price. Also ask your audiophile friend if he has any second hand headphones. I usually buy them used from my audiophile friends so that I save some money and get a good idea of exactly what I'm going to be buying before I pay money for it. I'm also on Waterloo campus btw. so the m50s straight cable is 159$ and come with 20$ gift card... Deal? 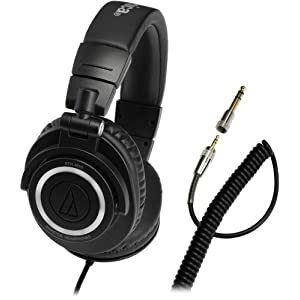 Audio-Technica has introduced a straight-cable version, ATH-M50s, of its flagship ATH-M50 headphones. Designed to provide an exceptionally natural response for professional monitoring/mixing, the headphones feature a closed-back, collapsible design with 45 mm neodymium drivers, circumaural ear pieces (180 swivel) and luxuriously padded ear cushions. A straight cable at the left earpiece terminates to a gold-plated mini-plug with included screw-on " adapter. Audio-Technicas sophisticated driver technology and superior components deliver exceptional power handling and very high SPL capabilities while maintaining clarity of sound throughout their extended range, with deep, accurate bass and outstanding high-frequency extension. The headphones feature proprietary large-aperture drivers with neodymium magnet systems for ultra-efficient signal transfer. im going down town tmr at 2ish to check out/buy it, wana come? If you want noise cancelling, it might be better to go passive and get a good pair of in-ears. They'll isolate noise a lot better than around the ear headphones. If not, you'll want some of Sennheiser's travel series of headphones, but those cost over $250. There's really no good noise cancelling options at lower ranges, unless you want to try some Bose stuff, at which point the price is perfectly fine because you're paying for the noise cancelling, not the sound. But it'd be best to try out a few things before buying. Shures aren't that good at noise cancellation. Get in ear or a true noise cancelling if you need it. The M50 is perfectly fine for regular noise, like every other closed headphone, as long as you're playing music in them. For travelling headphones, you should be looking for the best durability and noise isolation anyways. I don't think you should ever expect to have the peace and quiet to listen to your music analytically while travelling, so lossy sources and forgiving headphones work best as well. i have played around with IEMs for 4 years in high school and they have a lots of problem: they dont last long, they get dirty/lost easily. Plus after 4 years using in ear stuff, i start to noticed that my ears will have problem if i try to use them too much. The air pressure from using inear is really harmful for ur ear. So i switched to full size and love how they feel: surround and light (no air pressure on ears). I dont think i will go back to inear anytime soon despite the fact that its mid summer and my room is hot as a hell hole. Worst case i will buy 2 pairs of headphone: 1 open for travel and 1 closed but no IEMs stuff. Currently looking into Headphone.com stat page... suprisingly my current headphone AKG81DJ which worth 69 bucks according to amazone beat almost everything below 160 o.O... lighter, better sound range, better isolation... I hope what ever i buy tmr wont be a down grade x(.